WOODBURN, Ore. — The tulips are ready to share their beauty with visitors from around the world when the 35th annual Wooden Shoe Tulip Fest opens on Friday, March 23. An expansive 40 acres of tulips and daffodils in nearly 120 varieties and every color are the backdrop to activities that engage people of all ages. The 2019 Tulip Fest is open daily through April 29. The Iverson family farm began in 1950 and the family started growing tulips in 1974. The Wooden Shoe Bulb Company started in 1983, and in 2001 they changed the name to Wooden Shoe Tulip Farm. The fields are open this year from the end of March to the last week of April. In recent years, the farm has added a Fall Gift Shop, and in 2014, the family announced the farm’s newest addition, the Wooden Shoe Vineyards. Photography Tips . . .
Professional photographers and scrapbook aficionados alike have endless opportunities for creating terrific pictures. Iconic landmarks including the Wooden Shoe Tulip Farm’s windmill and pink tractor are great for any backdrop, with Mt. Hood an extraordinary addition – especially in the early-morning or early evening light. focus on such as the windmill, a hot air ballon, Mt. Hood, etc. The farm offers special events throughout the festival including local farm tastings, photography classes, musical guests, and more. 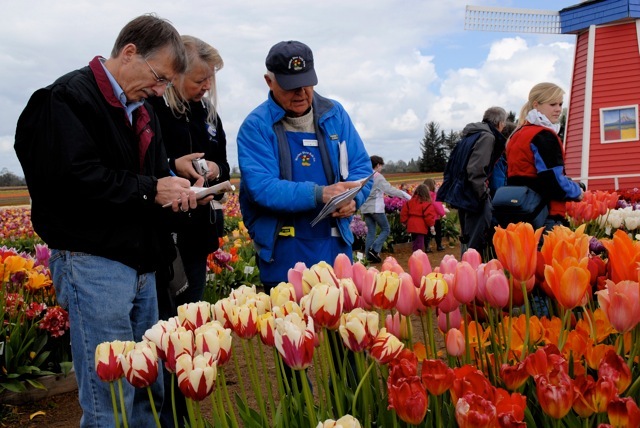 The events are continuously updated on the Tulip Farm’s website. Each day of the Tulip Fest, visitors can enjoy hay wagon rides, cow and tour train rides, and a children’s play area with slides and swings. There will be freshly picked tulips for purchase, flower displays to order for personal gardens, a great selection of food, and the world-class gift shop. The Wooden Shoe Vineyards tasting room will be open with daily wine tastings near the tulip fields from 11 a.m. until 6 p.m. Visitors to the Tulip Fest have access to the beautiful four-acre Wooden Shoe Event Garden for their own picnics whether they purchased food at the event or brought their own meal from home. On Saturdays and Sundays there are additional activities including wooden shoe making demonstrations, crafter tents, an expanded play area, pony rides, jump tents, zip lines, and paintball. Adults 21 years and older can enjoy the Wine Wagon Farm Tours. Visitors can check the weather conditions of the farm before their trip by visiting the Field Report on the Wooden Shoe Tulip Farm’s website, or the farm’s Facebook page. The Wooden Shoe Tulip Fest is open Monday through Thursday from 9 a.m. until 6 p.m. and Friday through Sunday from 8 am until 7 pm. Individual admission is $5.00 per person ages 13 and above with a maximum car charge of $20.00. Children 12 years and younger are admitted for free. Information on additional pricing options such as group tours can be found online @woodenshoe.com. For additional information, please visit woodenshoe.com.